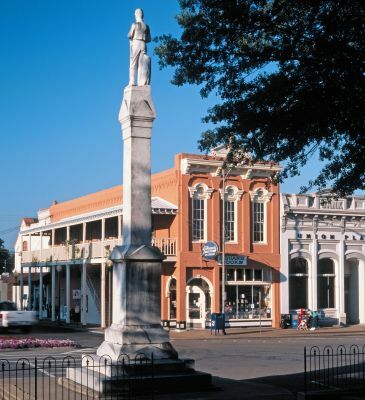 The historic Downtown Square in Oxford has always been at the center of city life. Visitors may enjoy browsing the unique shops, upscale boutiques and art galleries. Restaurants around the Square offer great dining options from casual to fine dining. This is where you will also find most of Oxford's nightlife and several annual festivals and special events. Square Books, housed in three separate buildings, is one of the most renowned independent bookstores in the U.S. The main store, located at 160 Courthouse Square, features literary fiction, books about the South and by writers from the South, as well as an extensive inventory of remainder titles. There is also a cafe and a second-floor balcony. A few doors away, at 129 Courthouse Square, Off Square Books includes lifestyle selections and Square Books Jr, located at 111 Courthouse Square, is the children's bookstore. Dedicated in 1997 to mark the 100th anniversary of William Faulkner's birthday, this bronze statue by William Beckwith is located at City Hall. It depicts William Faulkner holding a pipe and seated on a bench, looking out toward the Town Square. Oxford Film Festival - Local filmmakers and filmmakers from around the world convene in Oxford for four days each February to screen their works at The Lyric Theater on the Town Square. Oxford Conference for the Book - In March, authors, editors, publishers, educators, and book lovers celebrate reading, writing, and books, as well as the practical concerns of the publishing world. Double Decker Arts Festival - Held the last Saturday in April on Courthouse Square, this festival celebrates music, food, and the arts. Faulkner and Yoknapatawpha Conference - Faulkner scholars and enthusiasts from around the world gather for this literary event, held in late July each year, to celebrate the works of William Faulkner with lectures, discussions, dramatic readings and more. Rowan Oak, the former home of Nobel Prize winning author William Faulkner, is located on Old Taylor Road just to the south of the Town Square and near the Eastern edge of the University of Mississippi campus. The Greek Revival house was built by Robert Sheegog in 1848 and became home to Faulkner in 1930, where he resided until his death in 1962. Rowan Oak was declared a National Historic Landmark in 1968 and sold to the University of Mississippi in 1972. This is a favorite sightseeing stop for many Oxford, Mississippi visitors. William Faulkner's Underwood Universal Portable typewriter is displayed on his simple writing table in his study at Rowan Oak. William Faulkner's portable typewriter is on display at his former home, Rowan Oak. Vaught–Hemingway Stadium at Hollingsworth Field is the home field for the University of Mississippi Rebels football team. During football game weekends, according to estimates, Oxford's population almost triples and most are heading for the stadium — a must for any visiting football fans.